Bask in the sleek contemporary style of this Northwest Portland townhouse, an airy two-bedroom retreat with a gorgeous interior, private patio, and a wonderful location for exploring the Rose City. You'll find this two-level retreat in the Q21 Building, a modern and stylish building in the Slabtown area of Northwest Portland. This townhouse sits within blocks of fantastic restaurants and breweries, a New Seasons Market, a beloved stretch of shops on NW 23rd Avenue, the Pearl District, and so much more. 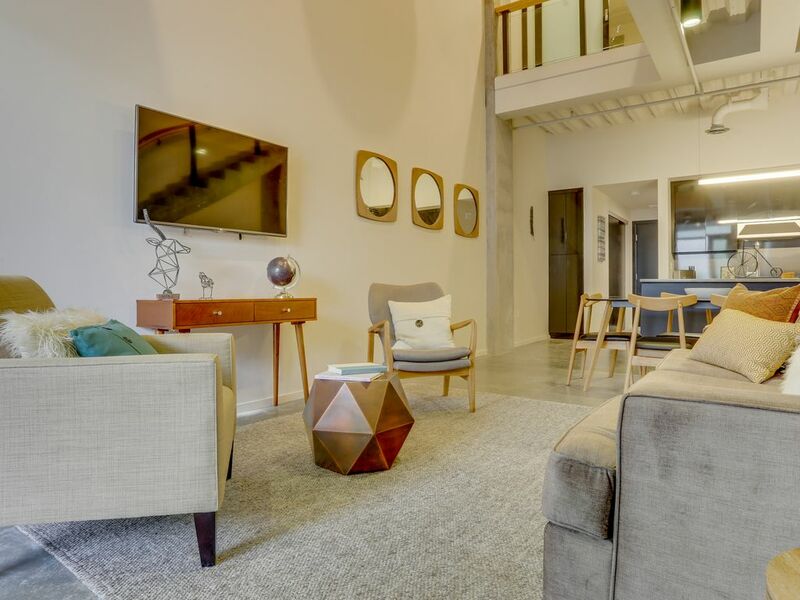 Whether you're visiting Portland for the food, the coffee, the beer, or the wondrous great outdoors, you'll feel right at home in the air-conditioned living space. Step inside to find lofty ceilings, a beautiful blend of building materials, and a plush sofa for reading, napping, and flipping channels on the flatscreen TV. Begin each morning by walking to St. Honoré Bakery or Blue Star Donuts, both of which are just seven blocks away. In the mood to prepare breakfast on your own? You'll have a chic kitchen with modern appliances, a coffee maker and a French press for your morning Stumptown, and even a dishwasher to help clean up. Gather with your loved ones around the six-person breakfast table, or bring the newspaper out to your private patio to work on a crossword before heading out to explore. With two bedrooms and two-and-a-half bathrooms, this beautiful Portland townhouse will accommodate six guests. Head upstairs to find a front bedroom with a queen-size bed and French doors that open to an outdoor space. The back bedroom offers a queen-size bed, and the living room is equipped with a comfortable sleeper sofa. Additional amenities include tub/shower combinations in each of the two full bathrooms and one garage parking space for your ease and convenience. Whether you're making your first trip to the Pacific Northwest or planning a return visit to Portland, you'll quickly fall in love with the city's unique charms. Here in Slabtown, you'll be just a few steps from the local favorite New Seasons Market, fantastic local beers at Breakside Brewery, and some of the best restaurants in the city, from Ataula and St. Jack to Paley's Place and Pok Pok NW. Spend a morning or two in Lower Macleay Park, where you can hike the Wildwood Trail deep into Forest Park or follow the path to Pittock Mansion with its spectacular view of downtown and Mt. Hood. Walk just one mile south to catch a Timbers or a Thorns game at Providence Park, and end each evening with the sweetest of treats from Salt and Straw on NW 23rd. Make your next home away from home in the heart of Northwest Portland - book this lovely townhouse today! Beautifully designed and great location! The beds were extremely comfortable and it was nice having 2 1/2 bathrooms. I loved being on the main level and within walking distance to a lot of great locations. I would recommend all my friends going to Portland to stay here. Excellent location for exploring Portland, convenient to restaurants, food stores, and coffee shops (natch!). Garage parking included, a huge benefit in this part of Portland. Perfect for a weekend getaway!! This was our second time renting one of the townhomes and it was great both times!! Very modern and in a urban neighborhood that is close to bars and restaurants. We even rode the scooters from downtown to the condo. So much fun!! Very close to countless restaurants and shops. Nice sunlight and layout. Everything we needed was available to us and the bonus of the gym was much appreciated. We felt safe and secure and had a great trip! Loved how central this was to everywhere I needed to be. Super easy checking in and wish I had more time.